The Dark Tower Review | Nikolaj Arcel adaptation falls short of the mark.
" How do you translate a series that pivots itself around King’s entire body of work? " "... the filmmakers have sidestepped direct translation of the novels in favour of a peculiar hybrid of modification and sequel. " It takes both a certain audacity as well as cavernous creativity to write a lengthy fantasy series that benefits from a comprehension of the author’s entire bibliography outside that fantasy series. This is especially so when that bibliography is as extensive as Stephen King’s. King is not only one of the world’s most popular authors, he is also one of the most prolific. Prolific, perhaps, to a fault. For almost every Andy Dufresene or Annie Wilkes or Pennywise there is a haunted laundry press. You don’t need to worry about the haunted laundry press to appreciate King’s celebrated seven-book fantasy saga, known as a group as The Dark Tower, but an appreciation of other King creations may help. For example, The Man in Black, one of the central antagonists in The Dark Tower, manifests himself in different guises in different King novels, first appearing in The Stand. It’s a complicated tapestry. King even writes himself into The Dark Tower at one point. I have read the first two books in the series, titled The Gunslinger and The Drawing of the Three respectively, and laboured to connect with King’s world. That’s not a problem for many people, as the series is as beloved as it has been successful, and my disconnection probably has much to do with my general disinterest in King’s prose. What I can appreciate is King’s immense imagination. It may have conjured up that haunted laundry press, but it is also responsible for Andry Dufresene and Annie Wilkes and Pennywise. King’s capacity for creation is marvellous. There are film adaptations of his novels that are exceptional. Nikolaj Arcel’s The Dark Tower is not one of them. Denseness is one issue. How do you translate a series that pivots itself around King’s entire body of work? 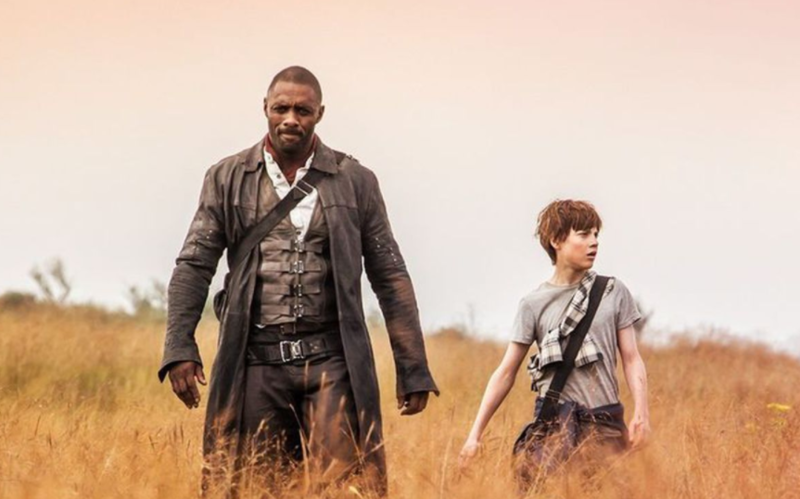 Even if Nikolaj Arcel’s film was to disregard King’s interconnected catalogue, the immediate lore of The Dark Tower is complicated enough to make adaptation a daunting task. Faced with such a task, the filmmakers have sidestepped direct translation of the novels in favour of a peculiar hybrid of modification and sequel. The core mechanics of King’s narrative have been stripped back to inadequate essentials that are outlined in text at the beginning of the film. The Dark Tower stands in the centre of the universe, stabilising it. Only the mind of a child can destroy it. That’s a drastic abridgement of King’s lore. The Man in Black is played by Matthew McConaughey. His purpose is to the destroy the tower. 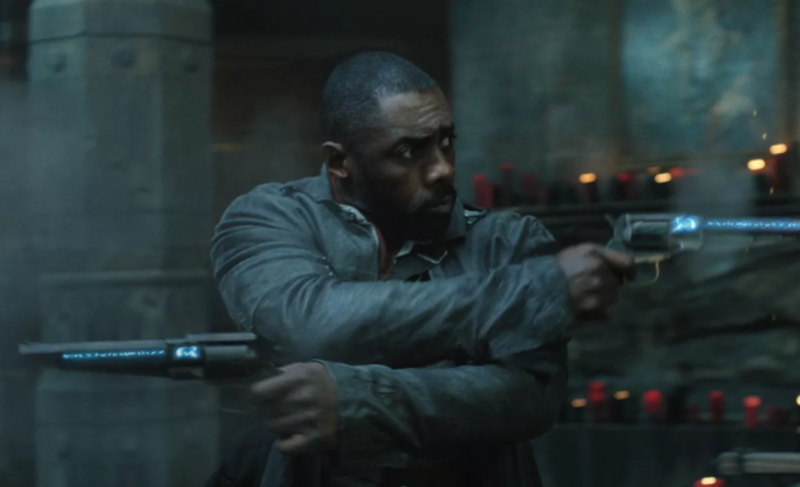 Roland Deschain, the gunslinger, is played by Idris Elba and his purpose is to stop The Man in Black from fulfilling his purpose. Jake Chambers is played by Tom Taylor and his purpose, within the context of this film, is to bridge McConaughey and Elba’s characters. That’s all there is to understanding Nikolaj Arcel’s The Dark Tower. It’s less than a lot of films. It’s a lot less than the source material. Jake is a young boy, living in New York City, that dreams of other worlds when he goes to sleep. His parents and his psychiatrist dismiss the dreams, but Jake knows that his visions of Mid-World, the Man in Black and the gunslinger correspond to some form of reality. A hop, skip and a few hasty plot progressions later and Jake finds himself accompanying that very gunslinger on his quest to destroy The Man in Black. Arcel doesn’t capture a sense of scope, which is arguably the main appeal of King’s saga. If the series of novels is not King’s masterpiece, then it is certainly his most ambitious undertaking. How unacceptable it is then, that this film is lacking that one crucial element, which is ambition. The road to the production of a film adaptation of The Dark Tower has been a long and difficult one. The simplification of the novels is undoubtedly an effort to broaden the commercial prospects of the film. But this isn’t merely simplification, it’s modification in a manner that will unquestionably provoke old fans and unlikely beget new ones.